"Yan Hui was only 29 when his hair turned white. He died young. Confucius wailed bitterly, saying, "Ever since I have had Hui, my disciples have grown closer to me." Classical texts also have Yan Hui (like Confucius himself) playing the qin.8 One example is in Zhuangzi Chapter 28 (Yielding Power). And the Qin Shi biography of Yan Hui, apparently drawing on Liezi, also has Yan Hui playing the qin. None of the commentaries mentions the structure or the modal characteristics of the melody. Regarding structure, the refrain found in many versions is perhaps the most distinguishing characteristic (because unusual, if nothing else). The refrain is written out at the end of the first section, then instructions at the end of each of the other sections say to repeat the refrain.13 There are also many musical couplets, with either the first phrase ending on la and the second on so, or the first on re then the second on do.14 These couplets and the refrain help suggest that the melody should flow along rhythmically. As for this song, it is traditionally said that Confucius wrote it lamenting Yan Hui. Yan Hui had been a disciple of Confucius only a short period when he unfortunately died early at the age of 32. Confucius' lament grieved that there was no one left to carry on his methods. Its sounds called out sadly with heavy sobs, clearly cut off. Beginning study of qin should be from here. And for those at the beginning level, if they skip this and search for something else, the more their skills increase, the more distant it is from their understanding. As for this composition, it is like these sounds and is an allegory. Da zai Yan Hui, da zai Yan Hui. Awesome Yan Hui; awesome Yan Hui. Si yi Yan Hui, si si yi yi Yan Hui. Think of Yan Hui, think and recall Yan Hui. Tian sang Yan Hui, tong Yan Hui Yan Hui. Heaven mourns Yan Hui, mourn Yan Hui, Yan Hui. Xian zai Yan Hui, xian zai Yan Hui. Worthy Yan Hui, worthy Yan Hui. Xian zai ruo zai, tian sang yu Yan Hui. Worthy and approved, Heaven has destroyed me, Yan Hui. Tong Yan Hui Yan Hui, tian sang yu Yan Hui. Mourn Yan Hui Yan Hui; Heaven has destroyed me, Yan Hui. Tong tian sang Yan Hui, di zi san qian jin bu ru. Mourn Heaven's destroying Yan Hui, 3000 students none his equal. Dao xue sang ye Yan Hui. Study of the Way is destroyed, Yan Hui. Si yi Yan Hui Yan Hui, Yan Hui Dao he cun? Recall Yan Hui, Yan Hui; Yan Hui, how can the Way survive? Tan hou shi wu ye, yu Yan Hui. Tian sang Yan Hui, Dao he cun? Dazai Yan Hui, dazai Yan Hui. Yan Hui Yan Hui, ting wu ge. Yan Hui, Yan Hui, hear my song. Sheng sheng zhi wei Yan Hui sang. The sounds are only for Yan Hui mourning. Tian sang Yan Hui, Dao xue sang. Heaven mourns Yan Hui, study of the Way is destroyed. Tong xi Yan Hui, ming he cu? Painfully grieve Yan Hui, how urgent was Fate? Bu qian nu, Yan Hui; bu er guo, Yan Hui. Doesn't vent anger, Yan Hui; won't repeat mistakes, Yan Hui. Bu xing duan ming si yi; jin ye, ze wang. Wei wen hao xue Yan Hui. 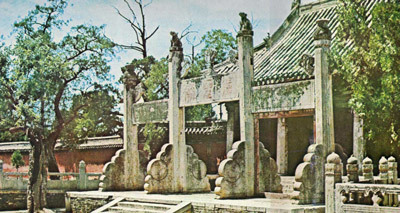 Yi xi dang chu, zai Chen jue liang Yan Hui. Recall the past, in Chen (state) without food, Yan Hui. Tong nian yi xi dang chu, zai Chen jue liang Yan Hui. Yi dan shi, Yan Hui; yi piao yin, Yan Hui. One bowl for food, Yan Hui; one gourd for drink, Yan Hui. Zai lou gang ren bu kan qi you. Hui ye, bu gai qi le. But (Yan) Hui didn't turn from his joy. Shangzai shangzai, min yao Yan Hui. Kuzai kuzai, ming yao Yan Hui. Bitter, bitter, fate killed young Yan Hui. Dizi san qian jin bu ru Yan Hui. Tian di tui qian you rong ru. Heaven and earth move along, waxing and waning. Si xu xun huan duo fan fu. Four seasons go round again and again. Ji hui cang hai bian sang tian. Ji du sang tian bian ling gu. Oft it is that mulberry groves change to hills and valleys. Shu wang han lai chun fu qiu. Summer goes, winter comes, spring turns to fall. Xi yang xi xia shui dong liu. Sun and stars westward set, rivers flow east. Jiang jun zhan ma jin he zai? Generals fighting on horseback, where are they now? Ye cao xian hua man di chou. Weeds block out flowers, filling the earth with gloom. Tan ren sheng zai hui nan. Mourn that man's life still is rough. The longest commentary is on Mencius, but the commentary with the present melody specifies Yan Hui, the only Yasheng contemporary to Confucius himself. I originally translated "Yasheng" as "Secondary Sage", short for "sage of secondary rank", i.e., the disciple second only to the Sage himself, but without such qualification that title implies minor, so I later changed the translation to "proximate sage". Taigu Yiyin does not directly indicate mode. Other handbooks tend to put it in shang mode (see Shenpin Shang Yi). Its tonal centers on so and re, with sections ending on do, also suggest shang is the most likely mode. Photo copied from Land of Splendours (pp. 436), an annotated collection of photographs from pre-1949 China. 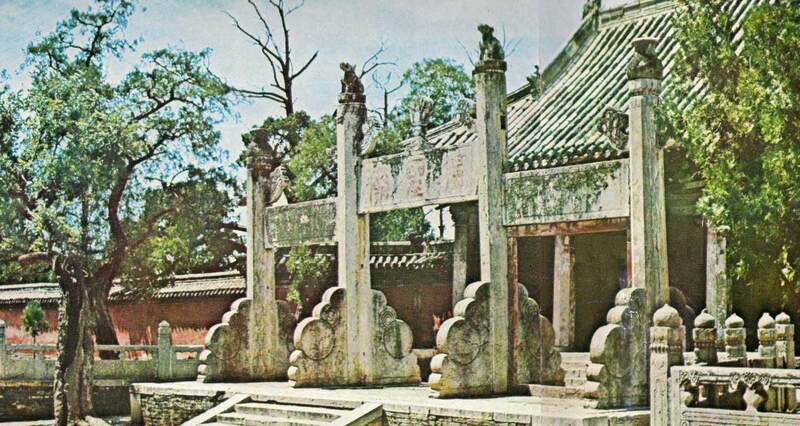 Temples to Confucius generally also have altars to Yan Hui near their altar to Confucius, but details on this and on separate Yan Hui temples have not yet been researched. See the translation by W.H. Nienhauser, et.al., The Grand Scribe's Records, Vol.VII, p.65. In The Analects, Book XI, Section 7, Confucius says that Yan Hui was eager to learn, but that unfortunately he had died young, and now there was no one. For Kongzi Jiayu see China Knowledge and the original text in the China Text Project. The Song Gaozong emperor (1127-1163) composed a eulogy for Yan Hui. I have not seen yet this. Whereas Confucius is often seen playing the qin while teaching, Yan Hui seems to do it for relaxation: it was natural self-cultivation. (The Zhuangzi passage, from the chapter 讓王 Rang Wang (Legge: Kings who have wished to resign the Throne), can be found in online in the China Text Project. Still later, an introduction to the unrelated later melody Qi Yan Hui suggests that Si Xian Cao was just one of several qin melodies passed down by Zhao Mengfu. As yet I have no further details on this. In addition the complete edition of Buxuxuan Qinpu (1556; surviving only in Taiwan) has a related 古顏回 Gu Yan Hui. Zha Guide 44/281/-- has this title only in Jinyu Qinkan (1937), a handbook included in Qin Fu but not re-published in Qinqu Jicheng. Regarding the title, 17613.23 says 泣顏回，曲牌名 Qi Yan Hui is the name of a qupai, adding that it was originally called 杏壇三操 Xing Tan San Cao (Confucius is said to have taught from a Xing Tan in Qufu). At some time during the Ming dynasty the character 泣 was apparently 諱 forbidden, at least in some contexts. Thus it is not clear when this title actually came into use as a qupai name, though evidently at some time in the Yuan or Ming dynasties there was a song structure using this title. Unfortunately, the dictionary entry does not mention any associated lyrics or clarify when the title came into use. On the other hand at least one old melody list (published in 1590) does include a title that may be related. The Qi Yan Hui tablature published in 1937 is in ruibin mode, with three untitled sections and no lyrics. It is attributed to Xu Yuanbai (1893—1957; so is it also here? ), but the lengthy afterword makes it clear that he actually adapted it from somewhere else. This afterword does not seem to say anything about the theme of the melody, only that it came from an old melody in the 簫管 wind instrument repertoire, was later adapted into the 琵琶 pipa repertoire by 嚴月秋 Yan Yueqiu, and from there it was made into a qin melody by Xu Yuanbai. The transcription of this 1937 version in Guqin Quji, Volume 1, pp.280-1, shows the main tonal center to be equivalent to the open 5th string (do); its modality is thus different from earlier melodies that use ruibin tuning. The introduction there (p.10, #31) begins by saying that Zhao Mengfu (1254 - 1322; see above) "passed down some guqin melodies such as Si Xian Cao" that show his fondnes for Yan Hui, but there was no mention of this in the Jinyu Qinkan commentary and, in any case, this version has no apparent musical relationship to any of the earlier Si Xian Cao melodies. More on this under Mozi Bei Ge. I have not examined the various versions closely enough to know whether any actually has a refrain that is written out each time. This does not seem to be as common in later versions, but I have not examined them carefully. It could be instructive to see whether/how this changes in later versions. Some passages, such as "in Chen with no food" (Verse 4), and "oceans change to mulberry groves" (Verse 7), have no apparent connection with Yan Hui. 17. "Summer goes, winter comes"
Caoman Yin in Chongxiu Zhenchuan Qinpu (1585); Caoman Yin was a predecessor of Xianweng Cao. There is as yet no information on the source of the lyrics in the first half of Section 7. Zha's Guide has three later handbooks also with commentary. 1525 says that although this piece is attributed to Confucius himself, the term "Yasheng" applied to Yan Hui is rather late, suggesting the melody itself is also later. None of these latter three repeats the claim that one must learn this melody or never properly understand the qin. 18460.32 滄海桑田 refers to 神仙傳 Shenxian Zhuan, originally by 葛洪 Ge Hong (283-343): affairs of the world constantly change. The lyrics of this quatrain thus have a similar meaning as that of the more famous one that follows. lyrics begin "大哉顏回//"; refrain begins, "賢哉顏回...."
(1573; #13) Si Xian Cao; same as 1585?